How to Download APK from Google Play Store? Download APK from Play Store on your Laptop PC and Android. Save file directly from Play Store on your Computer without G-Account. The subject of the post may seem little distinctive but you can download the APK of the App from Google Play Store without any Google Account. Play Store hosts millions of useful Apps to choose from and if you wish to download & save them in form of apk on your Android or PC for later use, you can do that for sure. Why would someone want APK’s? Many times the situations arrive where your Google Account may not log in to the Android, Play Store App get some issues or you don’t want to use Google Account? In any, case this article will surely be helpful. In order for a phone to have access to the Google Play Store, the full suite of Google apps known as Google Mobile Services, or GMS must be installed on the Android which in general is pre-installed on all the devices. The GMS apps include the likes of Google Maps, Google Framework Network, Google Account Services, Google Cloud Services along with the much ‘irritant’ Google Play Services. Download APK’s on PC and save the space on phone. Today in this post I will tell you a few methods to download apk from Google Play Store onto your Android Mobile or Windows or Mac Laptop PC. How to Directly Download APK from Play Store? Downloading APK from Play Store may not a very legit way to gain access to the original nature of the app due to Google’s Policy but yet if you are willing to download the same, below are the best ways to download APK files of Apps from the Store. Here are the best methods to download APK from Play Store on your Android and PC. The Yalp Store is one of the best alternatives to Google Play Store. The store lets you download Apps from Google Play Store without actually using the Play Store. All you need is to download the App Store and browse for your favourite App. The Yalp Store will download the App in form of APK from Google Server and also lets you download any updates if available. The App Store is a functional replica of the Play Store without any intervention by Google. The App does n0t require any Google services for its functioning. The App store design is very much simple. You will love it instantly. How to Use the Yalp Store? 1. Download and Install the Store. 4. Search for the App, update the Apps and install the APK’s with ease. Boom! You can download APK from ‘Play Store’ without using the Play Store. Thanks to Team – FDroid. 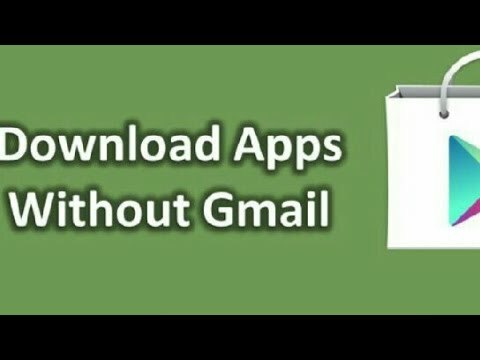 How to Download Apps from Play Store without Gmail Account? You can directly download APK from Google Play to your Computer PC with the help Chrome Extension. You need Firefox browser on your Laptop PC to download the APK’s from Play Store. Open Firefox Browser and search for APK Downloader Firefox Plugin and install it on the browser. Now open the extension and add the email address which is associated with your Google Play Account to save it with the APK Downloader. Also, you need to provide a device ID to the extension. To get the device ID, download the Device ID App from Google Play Store. Copy the Device ID and paste it into Plugin. Once done, open the Google Play Website and search for your favourite App. Here you will see the download button. Hit the button to download the APK. This method may not be much reliable as it provides the file from 3rd party source but the file is the same as that on Google Play Store. If you wish to have a quick download of the App then go for it. Step 1. Open play.google.com/store/ in your web browser and search for the Application that you need. Step 2. Copy the URL/Address of the App page. Step 3. Now go to apps.evozi.com/apk-downloader/ and paste the Google Play URL in the box. Step 4. Click on Generate Download Link and then Click on Click here to download to start the download of your APK file. Done! Note: This website serves App from 3rd party sources but claims to provide the same file like that on Google Play Store, you can check for MD5 file or developer certificate for the same. Raccoon is a Google Play desktop client that will enable you to download APK files from Google Play and cache them locally on your desktop computer. You can have a number of cache files and with the ability to hold apps in multiple versions. The Raccoon collects data from the Play Store by configuring with your Google Account and hardware profile to check compatibility. How to Install and Use Raccoon? Download Raccoon App from the link below. Follow instructions on the screen and allow access if firewall blocks. Once done, in the search box type your favourite App. Download your App as APK and install on compatible devices. If you’re looking for a simpler way to access APKs from Play Store, you can download the APK’s from third party sites which offer App files for Free. Though you won’t be downloading the APK directly from Google, the APK hosting websites like APKMirror are safe and trusted sources. They let you download the files which are freely available on Google Store but you cannot get access to paid ones as they have strict policies against piracy and unethical app hosting. But you can get access to some Apps which cannot be hosted on Google Store due to ToS and also get access to Beta and old versions of the App. Though not exactly APK extraction from Play Store, but the files are checked and saved over a secure server for users to download. 3.3 You agree not to access (or attempt to access) Google Play by any means other than through the interface that is provided by Google unless you have been specifically allowed to do so in a separate agreement with Google. You specifically agree not to access (or attempt to access) Google Play through any automated means (including the use of scripts, crawlers, or similar technologies) and shall ensure that you comply with the instructions set out in any robots.txt file present on the Google Play website. Conclusion: With the methods above you can download the APK from the Play Store. This will help you minimize the dependency on G-Apps and GMS Services. Also, you can receive updates whenever released on Play Store with the help of Yalp Store a freeware App Store by the F-droid organisation. Save the space on your Android phone by downloading the Apps on your PC which you can later sideload on your Smartphone. I hope the post was helpful. Do comment below for any assistance or support if needed. Cheers! If you've any thoughts on Download APK File from Google Play Store | Android or PC, then feel free to drop in below comment box.